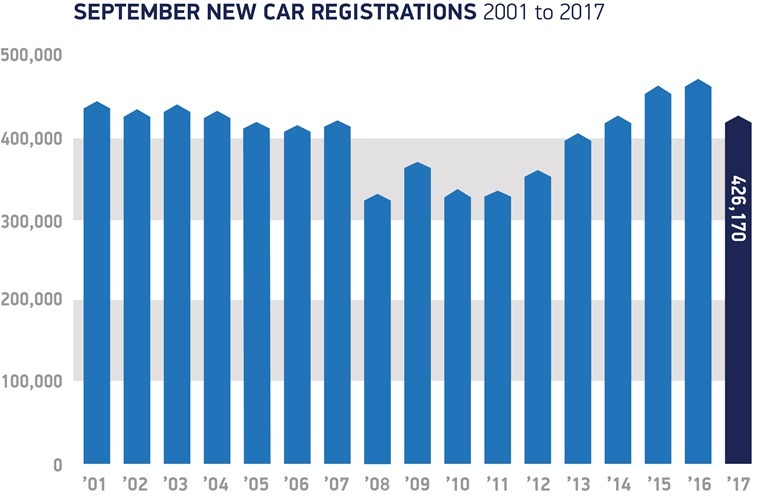 UK new car registrations fell for the sixth consecutive month in September, declining 9.2% year-on-year according to the latest figures from the Society for Motor Manufacturers and Traders (SMMT). In what is traditionally a key month for the industry following the introduction of a new registration plate, uncertainty surrounding Brexit and confusion about potential air quality plans have been blamed for the steep fall. Mike Hawes, SMMT chief executive said: “September is always a barometer of the health of the UK new car market so this decline will cause considerable concern. Demand dropped in all sectors with business, fleet and private registrations down –5.2%, -10.1% and –8.8% respectively. ContractHireAndLeasing’s data suggests the personal leasing sector remains resilient, as lease enquiries actually increased 16.6% year-on-year during September. Hybrid leasing enquiries were up by 300% in September, driven by strong demand for the Volkswagen Golf GTE. 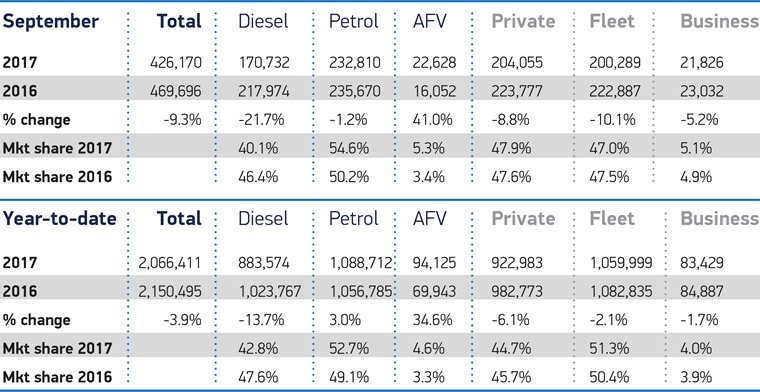 In the wider market, the 41% increase in alternatively-fuelled vehicle (AFV) registrations during September pushed year-to-date registrations to almost 95,000. This positive news couldn’t compensate for the declines elsewhere however, with demand for petrol cars down –1.2%, while diesel continues to fall out of favour, dropping –21.7% in the year-to-date. It’s primarily the confusion surrounding air quality plans has led to the fall in diesel registrations, with the SMMT stating it has undermined the roll out of the latest low emission models and is “thwarting the ambitions of the industry and government to meet challenging CO2 targets”. Despite being worse polluters when it comes to NOx and particulate matter, diesels actually produce much less CO2 than petrol cars. The SMMT warns that if the decline continues, average new car CO2 levels could actually rise this year – the first time this has occurred since records began. Despite the decline, the UK new car market remains at historically high levels, with over two million new vehicles registered so far this year. So what’s hot and what’s not this month? 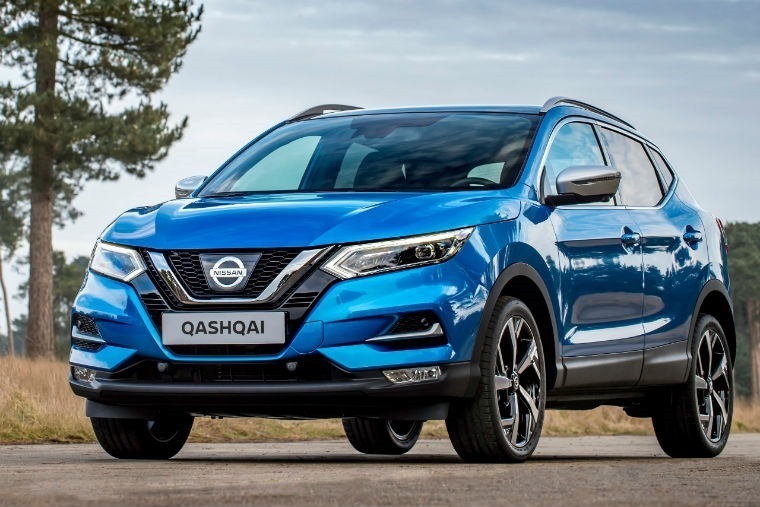 Well it’s Nissan’s Qashqai that proved most popular in September, taking the number one spot from the Golf. No doubt boosted by its recent refresh, year-to-date it’s currently the UK’s fourth most popular car. But it’s the Fiesta that’s still way out in front as 2017’s most popular car and, with an all-new version available now, this is likely to continue well into 2018.